Learn a little about who we are and how we work via review of our commonly asked questions and our replies. Colorado Rapid Avalanche Deployment is a 501(c)3 non-profit organization that focuses on the training, preparation, and validation of avalanche deployment teams for successful search and rescue in Colorado. C-RAD offers in-house training opportunities, as well as scholarship funds for our members to attend external avalanche rescue courses. Our organization is NOT a fielding organization, which means that our members must be affiliated with an organization that provides the opportunity to field during a deployment. Examples are ski patrol teams, county search and rescue groups, and the local sheriff’s office. What is a Validated C-RAD Team? A validated C-RAD team consists of 3 members: an avalanche dog, the avalanche dog handler and an avalanche technician. 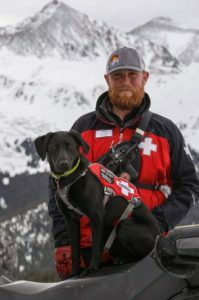 The dog and handler duo are validated through C-RAD, which ensures they’re able to interview a reporting party appropriately and efficiently, while also clearing a mock avalanche field of an unknown number of buried victims within an allotted amount of time. The avalanche technician is trained in the Incident Command System and is able to execute avalanche rescue using a beacon, RECCO device and extrication tools at a highly proficient level. This person is also able to operate as site commander, and oversees all tasks and information relevant to the rescue. Traditionally the three members deploy together, working in support roles or as primary rescuers, and can relay information and needs back to an incident command. How can my organization request a C-RAD Team? In Colorado, all backcountry rescue efforts are ultimately the responsibility of the county’s sheriff’s office; therefore, any resource desiring to field on a mission should have a working relationship with their sheriff’s office to properly deploy in their county or be available to respond on mutual aid to another county. If you are with a sheriff’s office or a search and rescue team, the first step would be to identify any validated teams within your county at the local rescue/patrol programs level. We can help by providing contact information for our members who have validated through C-RAD and are working in your area. If no validated teams are available within your county and its affiliated organizations, then a request for mutual aid from a neighboring county could be made through their sheriff’s office or search and rescue team. C-RAD is happy to support any fielding organization in identifying and vetting teams within their area that are validated through C-RAD. All C-RAD members are affiliated with a professional rescue organization. These organizations include ski patrol teams, search and rescue groups and county sheriff’s offices. See our list of affiliated organizations to identify which are actively involved with C-RAD. Most affiliated organizations have a C-RAD in-house point of contact who can provide more information on its level of involvement. The best way to get directly involved with C-RAD is to first become more involved with an affiliated organization. Once you’re in good standing, each organization will have an in-house process on when and how they would like their people to integrate with C-RAD. Can any dog be an avalanche dog? C-RAD is a large group of dog lovers. Even though we believe every dog is a good dog, not every dog is born to be a working dog. Over time, the process for selecting and developing working dogs has evolved and become an art, backed by scientific evidence supporting certain breeds and personality traits. “Drive” is our biggest trait, which is the dog’s energy and desire to complete the task it is being asked to do. Successful working dogs have a high drive to complete their task, and for our dogs, that is finding avalanche victims. Most handlers work extensively with their breeder through interviews and meet and greets to find the dog that fits best with their lives and the life of a working dog. Our C-RAD teams have had great success with a variety of breeds, many in the sporting or working dog lines. Labrador Retrievers, Golden Retrievers, Collies, Aussies, and Shepherds are the top breeds of our C-RAD dogs. They all have unique personality traits associated with their breed that makes them a perfect fit alongside their handlers. Within the C-RAD program, all dogs are owned and cared for by their handlers. Our affiliated organizations have different levels of support for their dogs and handlers, but ultimately the dogs go home with their handlers and live with them in the evenings and days off. Can I send my dog to be trained?/Can I give C-RAD a dog? An immense amount of time and energy goes into establishing the bond between a handler and a dog. Although it’s extremely generous for someone to consider giving a dog to our program, we do not have the ability to receive a dog to be trained in the program without a present handler. To become a handler, you must first be a C-RAD member or be involved with one of our affiliated organizations. If you are a breeder who would like to provide a dog for an aspiring handler, please contact us directly.